Don’t miss this thrilling, fast-paced, conflict-ridden urban fantasy from T.F. Walsh. 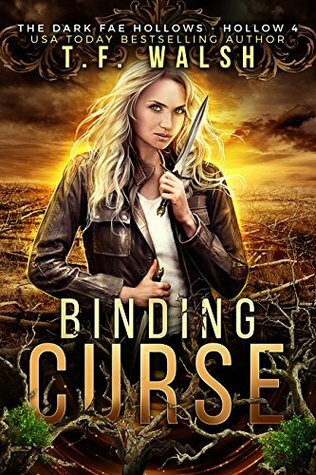 If you enjoyed works by Ilona Andrews and Kelly Meding, Binding Curse is for you. I received Binding Curse in return for an honest review from the author. Luna's world has changed so much over time and now she has to wait still a year for her world to be healed. She's has come a long way after losing her sister but it's only the beginning. When a prisoner she's t taking in turns out to be more than she expected. Living among the humans can be rough when they don't trust you things end badly. When bodies are turning up she has to take the word of Alex if she wants to save everyone. The closer they get into finding out what's really going on could be the end of them both. Will they find the real killer in time? I like Luna she has issues but I think it just makes her even better. I love when my main characters have tragic stories that unite them into a strong couple. I admit I wasn't 100 right off the bat about a potential love interest but he grew on me stealing a little spot in my heart. I've had my eyes on Binding Curse knowing that I had to drive right as soon as I had a copy in my eyes. The Dark Fae Hollow is a series of standalone novels that share the same concept intertwining into a captivated series. I love the fae concept it's a beautiful story that captured my heart as well as my imagination. Binding Curse is an action packed, a steamy sweet romance that is hard to put down you just have to know how it's going to end. The characters are great Luna is easy to connect with you can't help loving her right from the start. This is my first book by the author and found the writing style easy to get lost in. I can't wait to check out more books by the author as I loved Binding Curse so much. Highly recommend for fans of the fae concepts.